The Proton rocket with Express AM8 rolled out Friday to the Complex 81 launch pad at the Baikonur Cosmodrome in Kazakhstan. 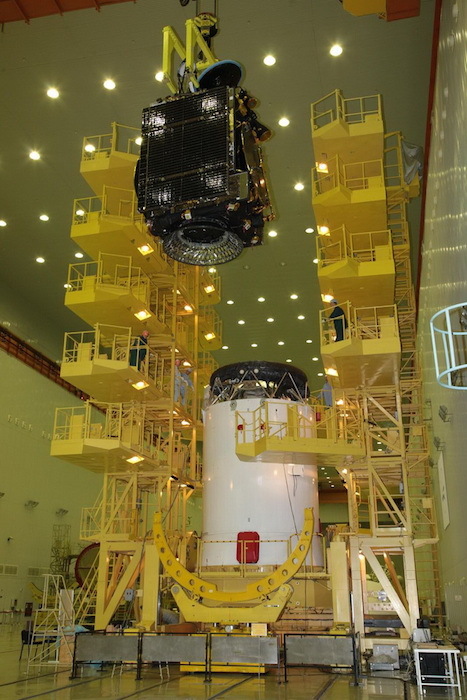 The Express AM8 satellite, seen here being lifted atop its Block DM upper stage, will provide communications services across an area stretching from the Americas to Russia. 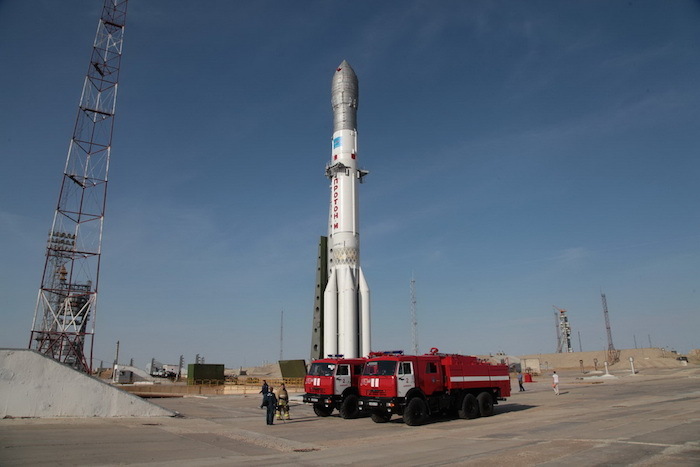 Russian Federal Space Agency announced that a Proton-M carrier rocket launch with a Russian Express-АМ8 telecommunications satellite is scheduled for Monday evening. MOSCOW (Sputnik) — A Proton-M carrier rocket launch with a Russian Express-АМ8 telecommunications satellite is scheduled for Monday evening, a spokesperson for the Russian Federal Space Agency (Roscosmos) has said. It is the second launch after an incident in May, when a Proton-M carrier rocket failed to deliver the Mexican MexSat-1 satellite into orbit. The first successful launch of the Proton-M carrier rocket with the British telecommunications satellite Inmarsat-5F3 took place on August 28. "The launch is scheduled for 10:00 p.m. Moscow time [19:00 GMT] on September 14. The separation of the Express-AM8 [satellite] from the Briz-M upper stage is expected to take place on September 15, at 4:37 a.m. Moscow time [01:37 GMT]," the spokesperson told RIA Novosti. Express-AM8 has an operational life-time of 15 years. The satellite's weight is 2,100 kilograms (4,629 pounds), with the payload mass of 661 kilograms (1,457 pounds). The satellite is designed to provide television and radio broadcasting, data transmission, multimedia services, presidential and governmental communications, telephony, mobile communication in the territory of western and central Russia, Europe, Africa, the Middle East, as well as South and North America.